San Jacinto College Central has invited us for a March residency that’s going to cover a LOT of ground! The emails have been flying about the concert programming and it’s going to be a lot of fun, with fanfares and ragtime and Bob Becker’s “Palta” arranged for steel band – it’s going to be great. Here’s the week’s plan, direct from SanJacPercussion: “We are very excited to be hosting percussion royalty in March. 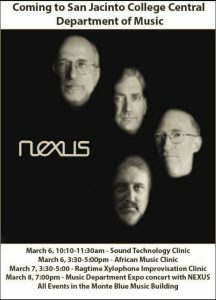 NEXUS will be our guests for our annual Expo concert at San Jac Central. They will deliver a clinic on Sound Technology Monday March 6 from 10:10-11:30am, a cinic on African Music Monday March 6 from 3:30-5:00pm, a Ragtime Xylophone clinic Tuesday March 7 from 3:30-5:00pm, and the concert in our music building March 8 at 7:00pm. This concert will feature Nexus with our Brass Ensemble, Steel Band, Percussion Ensemble, and Wind Ensemble. Also joining the fun is our Jazz Ensemble and Guitar Ensemble. ALL OF THIS IS FREE AND OPEN TO THE PUBLIC!” You can find the Facebook event page here. Hope to see you there! !